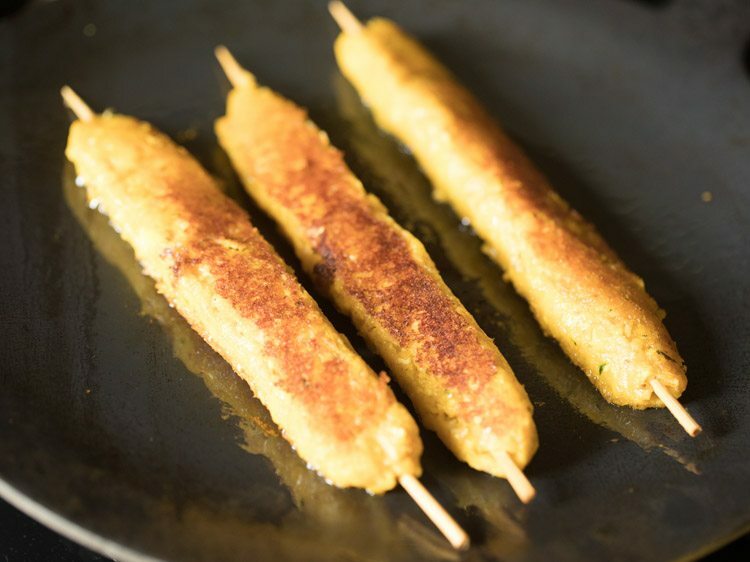 this crispy and tasty sweet corn kabab is an easy to make snack. 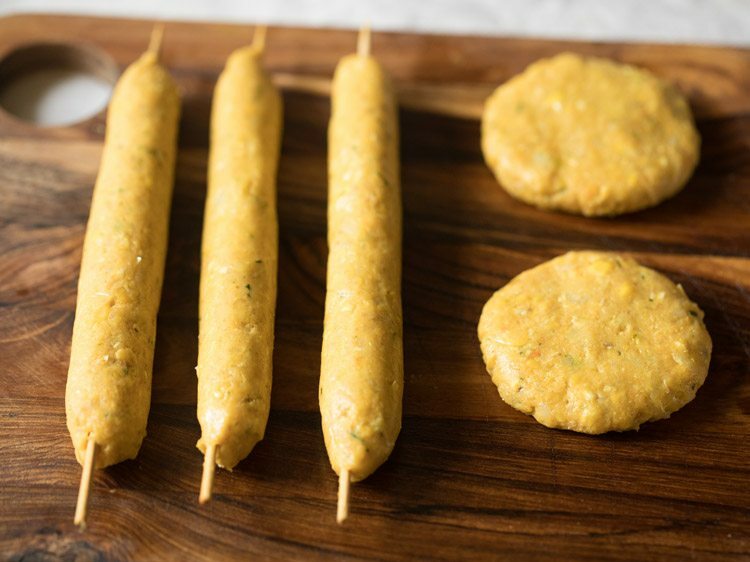 corn kabab recipe with step by step pics. 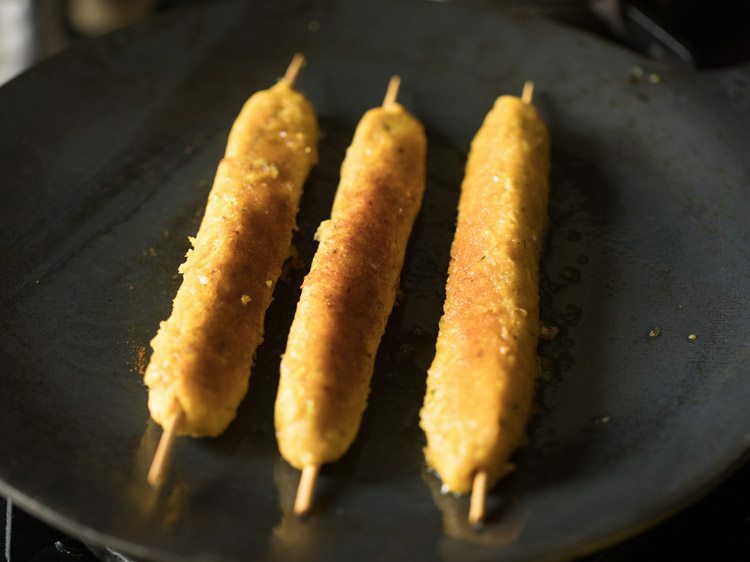 this crispy and tasty sweet corn kabab is an easy to prepare snack. 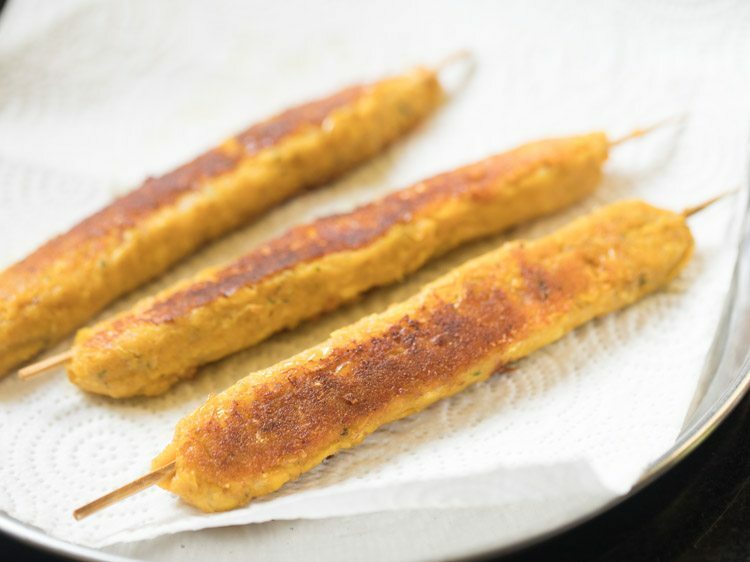 with the kabab recipe shared here you can also make corn cutlets. you do not need an oven to make these kababs. although if you have an oven, you can bake or grill these. 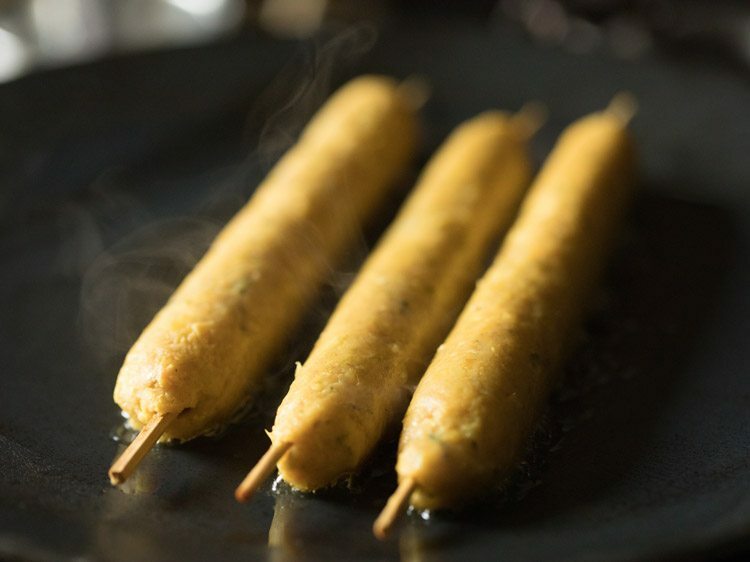 just a tava or a frying pan is used to make these corn kebabs which are pan fried with little oil. thus these are not loaded with fat. i have also shared the recipe of corn cutlet recipe earlier. 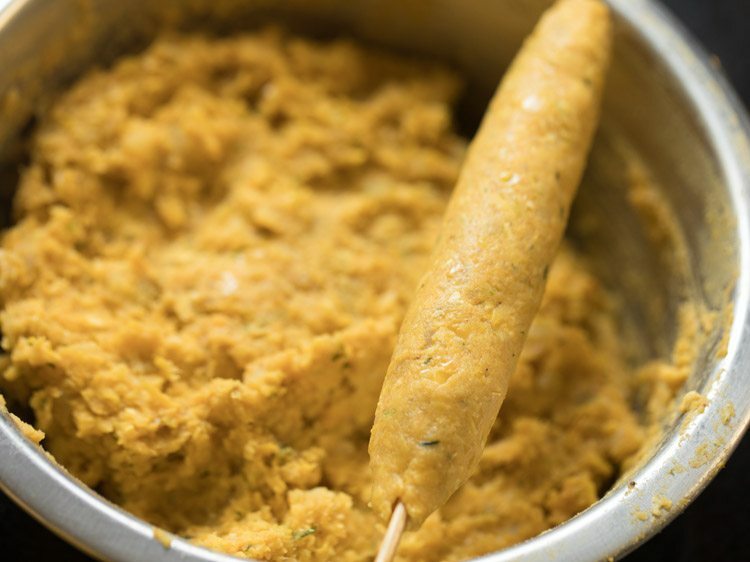 the ingredients to make corn kabab are easily available in an indian kitchen and you do not need to go hunting for special ingredients. for less work, you can make the kabab mixture a day before. then refrigerate it and make kabab the next day. 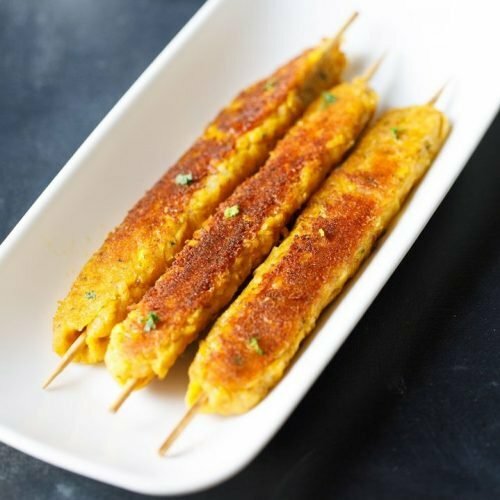 serve corn kebab as an evening snack or as a starter snack. 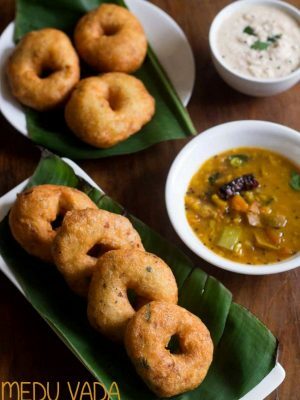 you can serve with any dip or chutney of your choice. firstly take 2 medium to large corn cobs and 4 medium potatoes in a pressure cooker. add water just about covering the potatoes. pressure cook for 5 to 6 whistles on medium flame. when the pressure settles down open the lid. 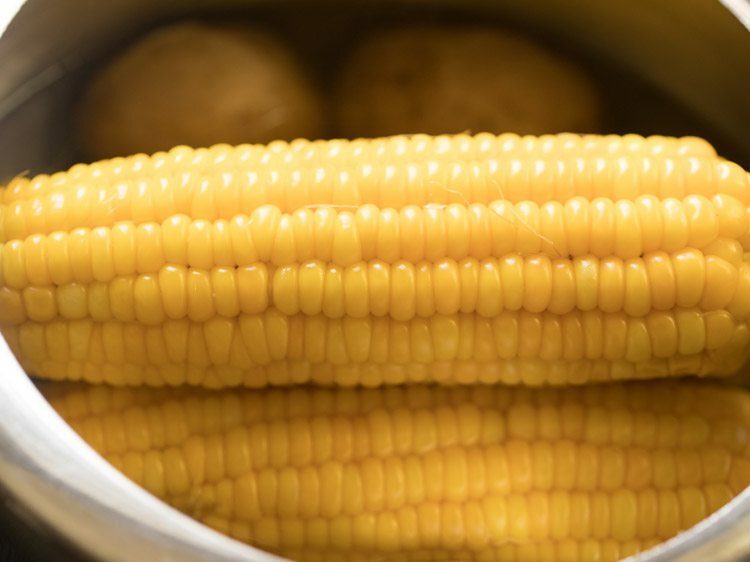 drain all the water and let the corn cobs and potatoes become warm or cool down. then using a sturdy knife slice the cooked corn kernels. 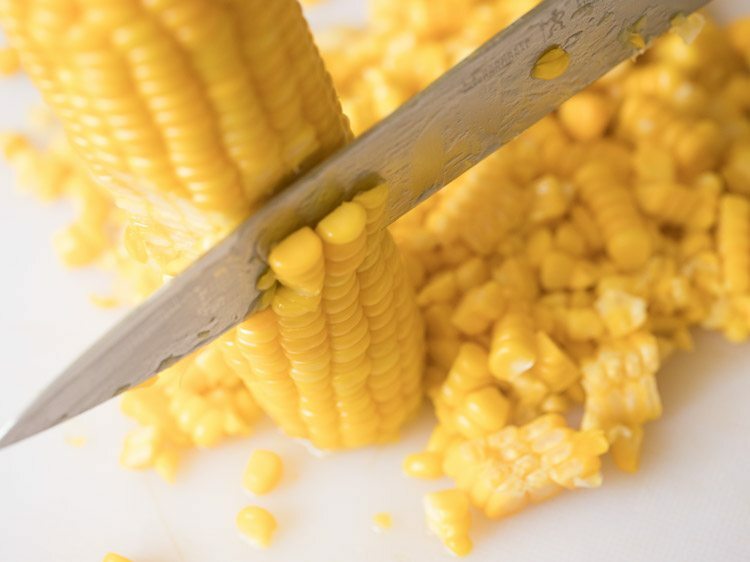 be careful when slicing the corn kernels. you will need 2.5 cups corn kernels. 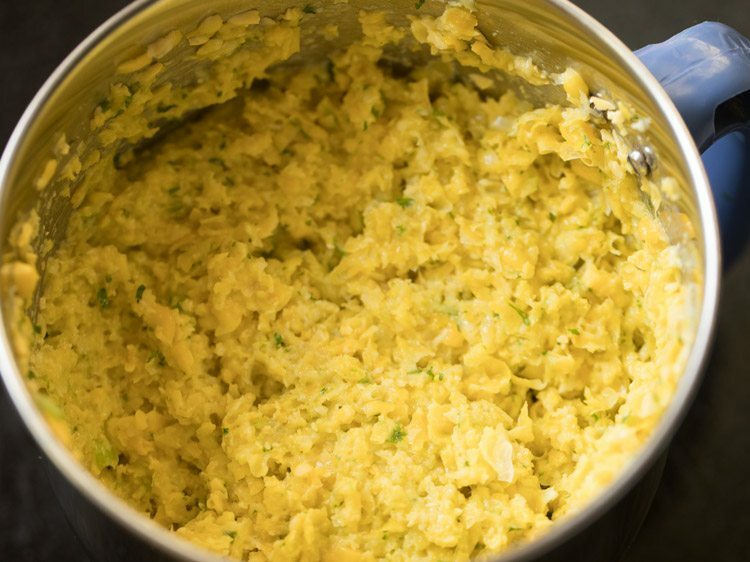 add the corn kernels in a grinder jar. also add 1 green chilli, 1 teaspoon chopped ginger, 1 teaspoon chopped garlic and 2 tablespoons chopped coriander leaves. grind to a semi fine paste. if you want you can make a fine paste also. keep the corn paste aside. 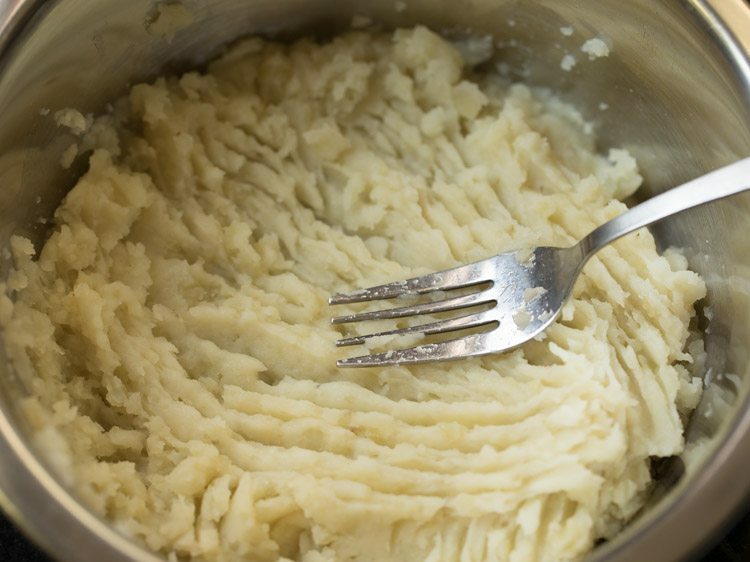 when the potatoes become warm or cool, then in a bowl, peel and mash the potatoes with a fork or potato masher. let the mashed potatoes cool completely before you add other ingredients in it. 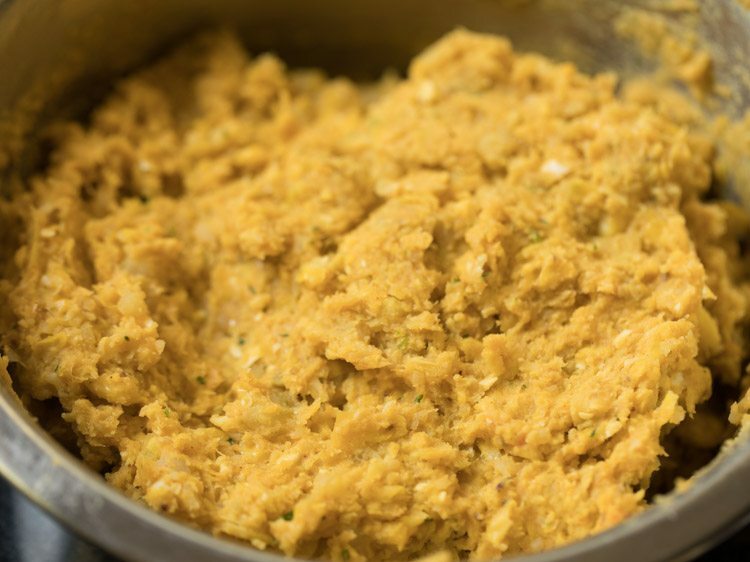 to the mashed potatoes, add the ground corn paste. 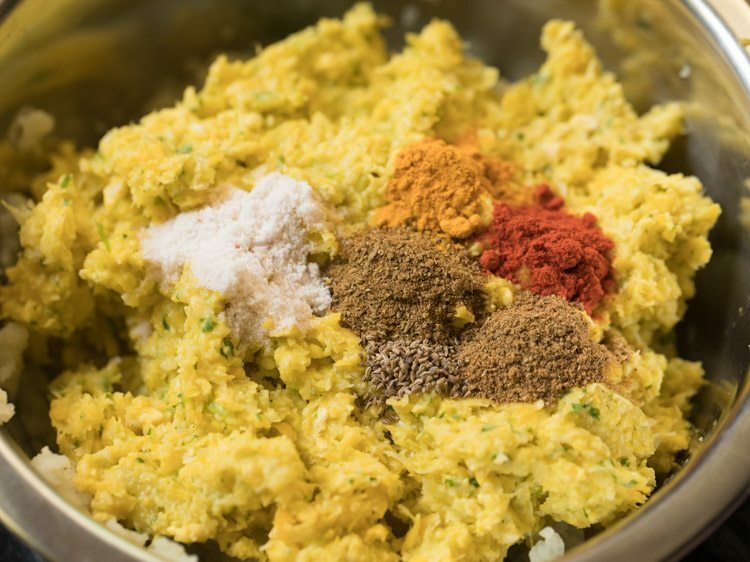 now add the following spices – ¼ teaspoon carom seeds, ¼ teaspoon turmeric powder, ½ teaspoon kashmiri red chilli powder, ½ teaspoon cumin powder and ½ teaspoon garam masala powder. also add salt as required. add 1 teaspoon lemon juice. 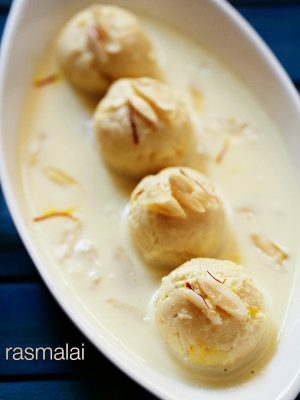 instead of lemon juice you can also add ½ to 1 teaspoon dry mango powder (amchur powder). now add 5 to 6 tablespoons rice flour or roasted besan. 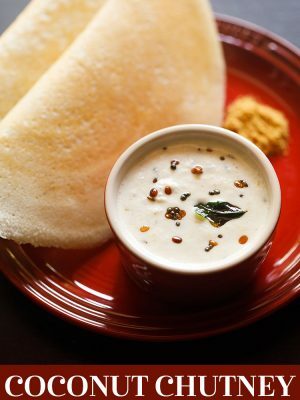 rice flour is used as a binding ingredient. 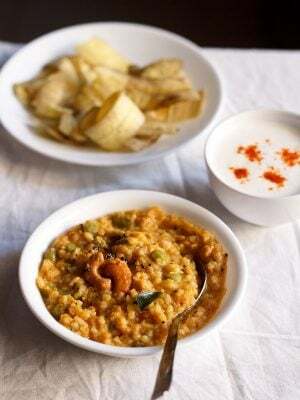 for roasting besan, roast it in a small pan on a low flame till it becomes aromatic. mix very well. 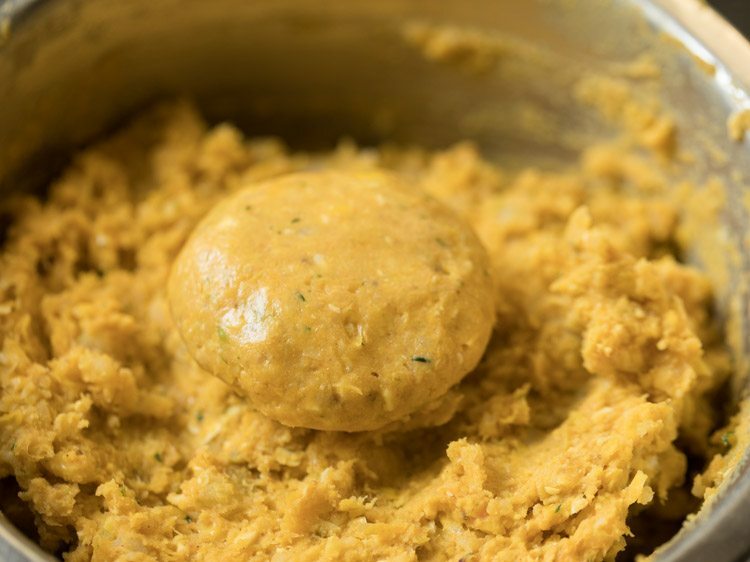 cover the bowl and refrigerate the corn kabab mixture for 30 minutes. meanwhile rinse some bamboo skewers and dry them with a kitchen towel. grease your palms with a bit of oil. now take a large portion of the kabab mixture and flatten it. place a bamboo skewer on the flattened kabab. shape, roll and seal both the edges. make a sausage like shape. now gently roll and shape into a kabab. alternatively you can roll the skewer on a wooden board to shape the kebab. 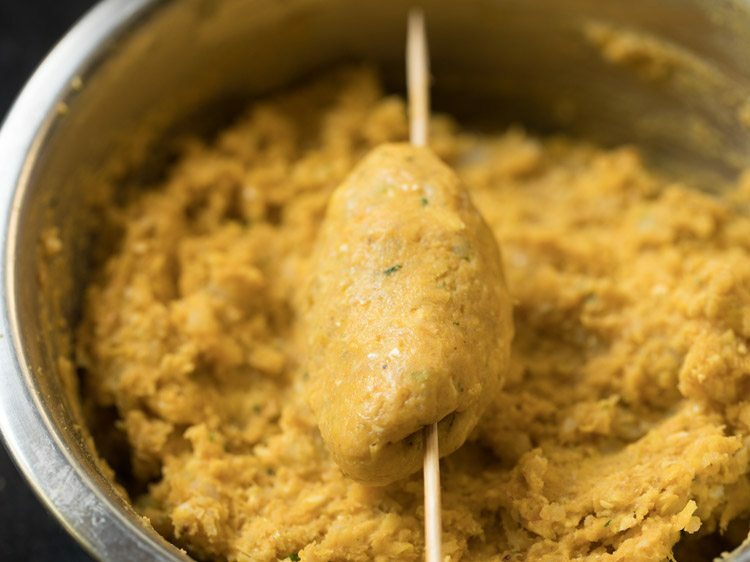 make all corn kababs this way. if you do not have a skewer, then just flatten the kabab mixture like cutlets or patties. heat a heavy tawa or griddle. add ½ to 1 tablespoon oil. use this much amount of oil for frying 3 to 4 kababs. on a medium-low flame let the corn kebabs get pan fried. do use a well seasoned pan. do not use pans where food can get stuck. then gently turn over and cook the other side of the corn kabab. 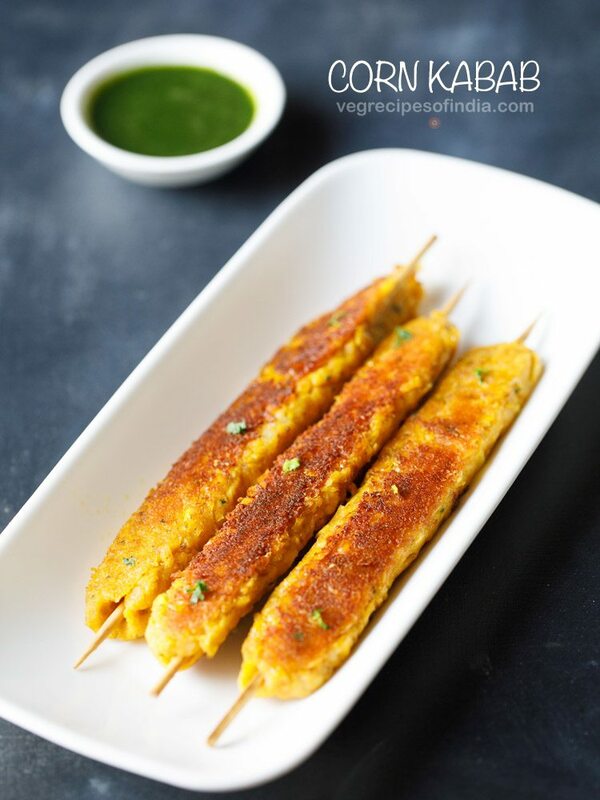 this way you can turn a couple of times till the corn kebabs are crisp, golden and fried well. once done remove on paper towels. this way pan fry all the sweet corn kebab. 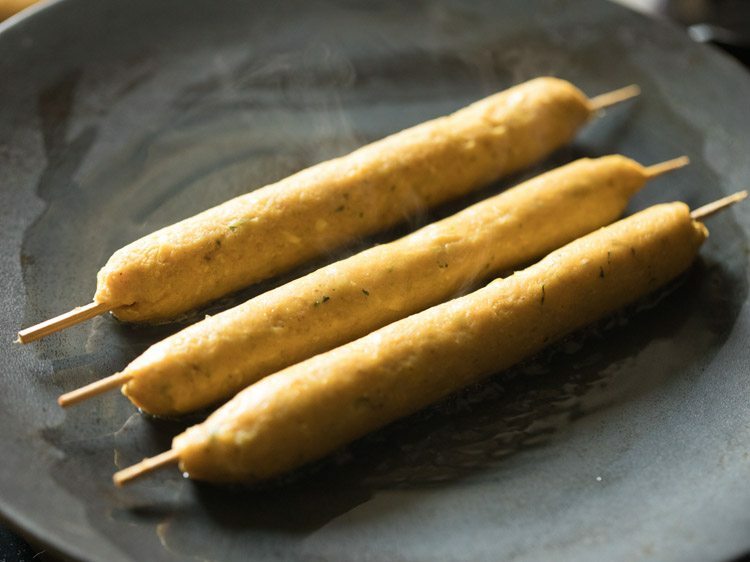 serve sweet corn kebab with any tamarind dates chutney or mint curd chutney or coriander chutney or mint-coriander chutney. while serving sprinkle some chaat masala from top. place the kabab on a greased tray or parchment paper or foil or a metal rack. brush some oil on the kabab. place in a pre heated oven and bake or grill at 180 degrees celsius till crisp and golden. 1. firstly take 2 medium to large corn cobs and 4 medium potatoes in a pressure cooker. add water just about covering the potatoes. pressure cook for 5 to 6 whistles on medium flame. 2. when the pressure settles down open the lid. 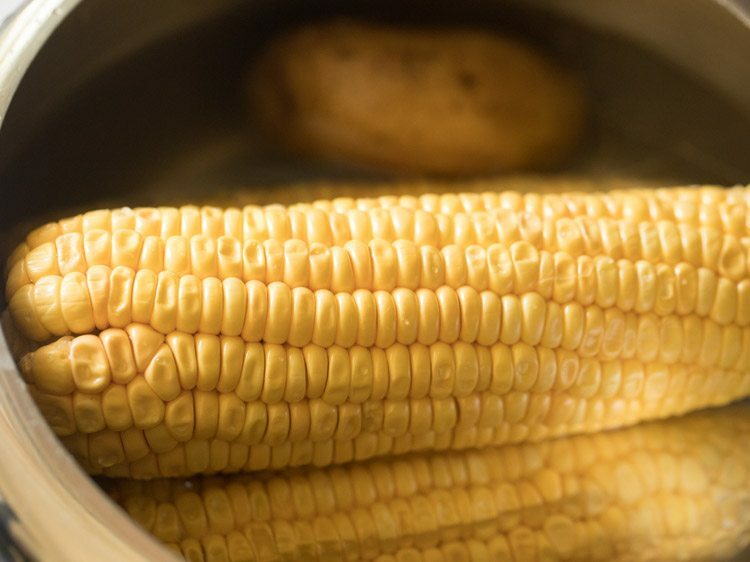 drain all the water and let the corn cobs and potatoes become warm or cool down. 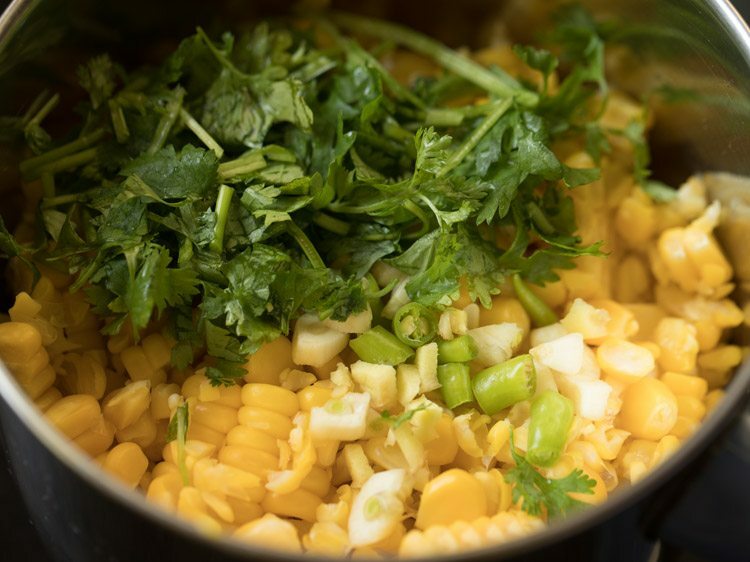 3. then using a sturdy knife slice the cooked corn kernels. be careful when slicing the corn kernels. 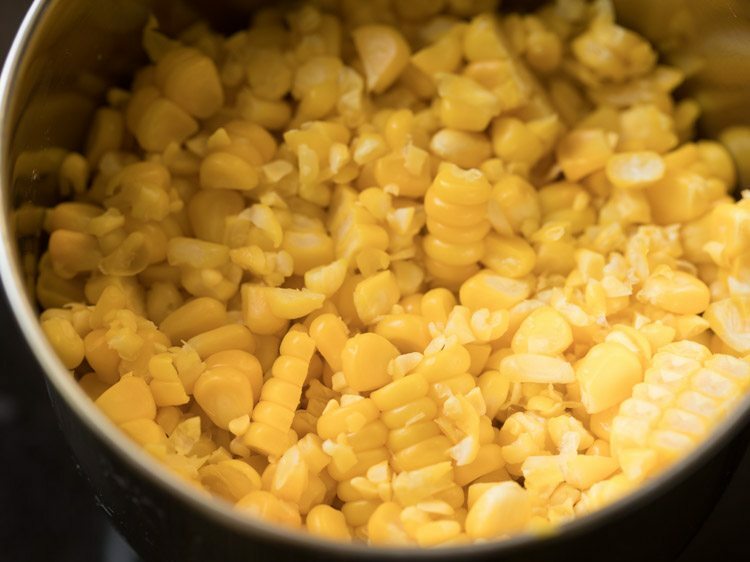 you will need 2.5 cups corn kernels. 4. add the corn kernels in a grinder jar. 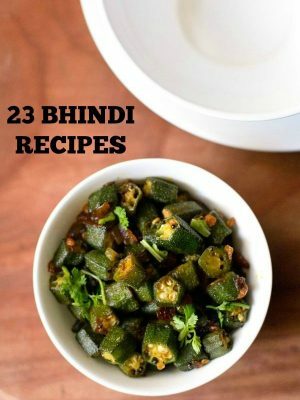 5. also add 1 green chilli, 1 teaspoon chopped ginger, 1 teaspoon chopped garlic and 2 tablespoons chopped coriander leaves. 6. grind to a semi fine paste. if you want you can make a fine paste also. keep the corn paste aside. 7. when the potatoes become warm or cool, then in a bowl, peel and mash the potatoes with a fork or potato masher. let the mashed potatoes cool completely before you add other ingredients in it. 8. to the mashed potatoes, add the ground corn paste. 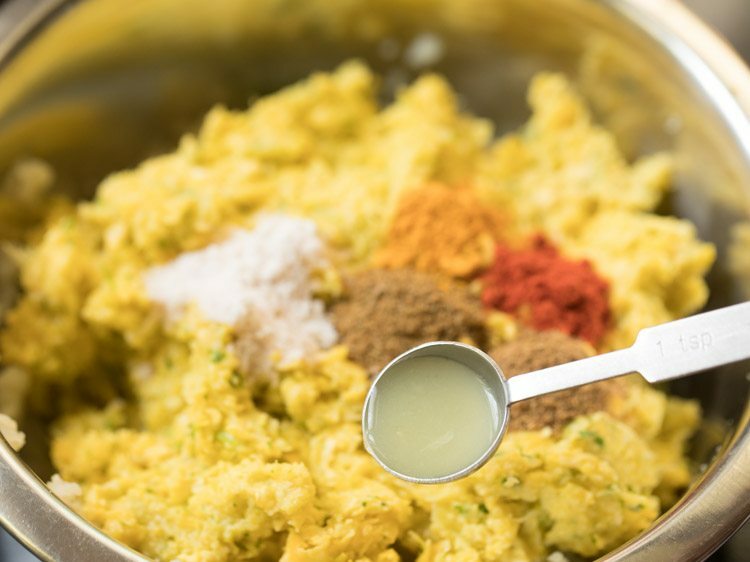 9. now add the following spices – ¼ teaspoon carom seeds, ¼ teaspoon turmeric powder, ½ teaspoon kashmiri red chilli powder, ½ teaspoon cumin powder and ½ teaspoon garam masala powder. also add salt as required. 10. add 1 teaspoon lemon juice. 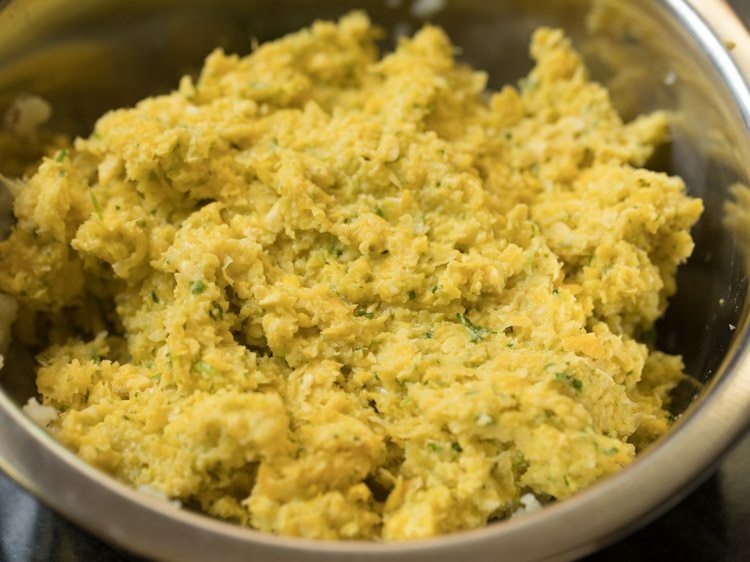 instead of lemon juice you can also add ½ to 1 teaspoon dry mango powder. 11. now add 5 to 6 tablespoons rice flour or roasted besan. 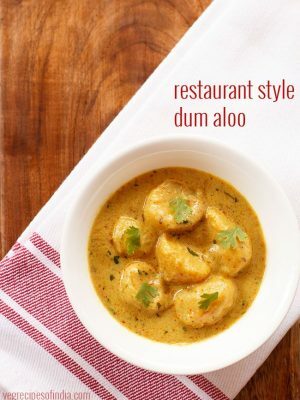 rice flour is used as a binding ingredient. 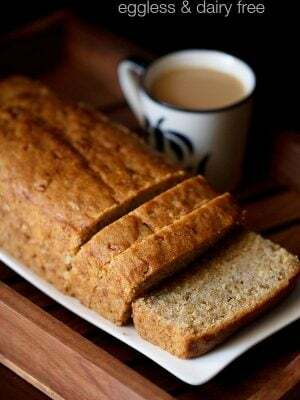 for roasting besan, roast it in a small pan on a low flame till it becomes aromatic. 12. mix very well. 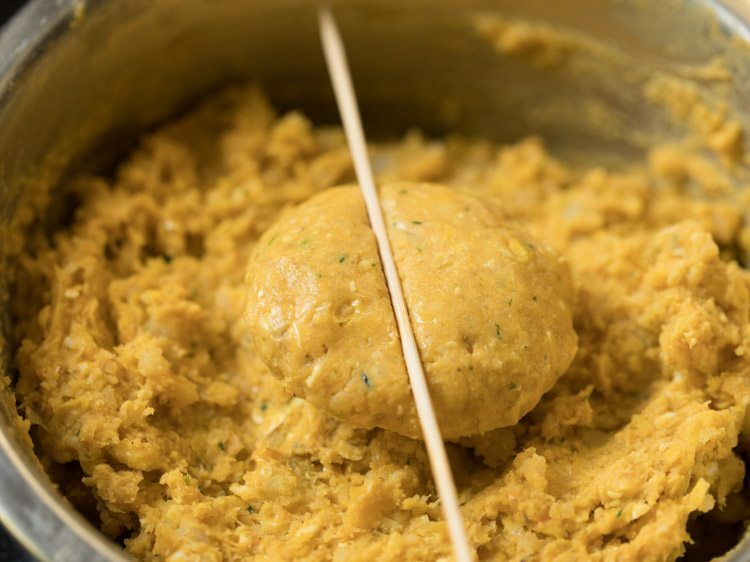 cover the bowl and refrigerate the corn kabab mixture for 30 minutes. meanwhile, rinse some bamboo skewers and dry them with a kitchen towel. 13. grease your palms with a bit of oil. 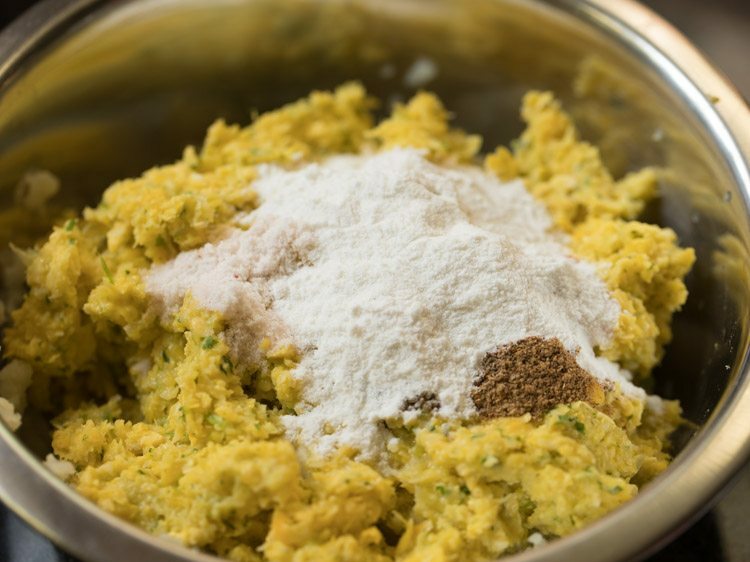 now take a large portion of the corn kabab mixture and flatten it. 14. place a bamboo skewer on the flattened kabab. 15. shape, roll and seal both the edges. make a sausage like shape. 16. now gently roll and shape into a kabab. alternatively you can roll the skewer on a wooden board to shape the kebab. 17. make all corn kababs this way. if you do not have a skewer, then just flatten the kabab mixture like cutlets or patties. 18. heat a heavy tawa or griddle. add ½ to 1 tablespoon oil. use this much amount of oil for frying 3 to 4 kababs. on a medium-low flame let the corn kebabs get pan fried. do use a well seasoned pan. do not use pans where food can get stuck. 19. then gently turn over and cook the other side of the kabab. 20. this way you can turn a couple of times till the kebab is crisp, golden and fried well. 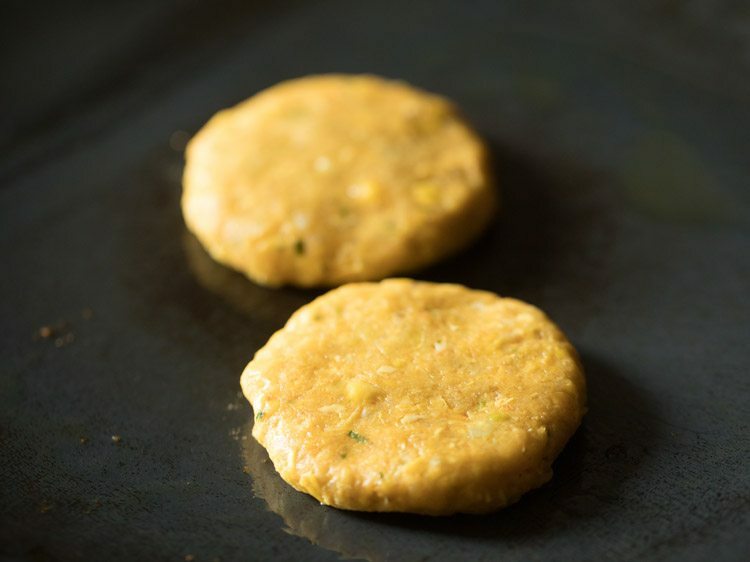 21. pan fry sweet corn kabab till they are nicely crisp. 22. remove on paper towels. this way pan fry all the corn kebab. 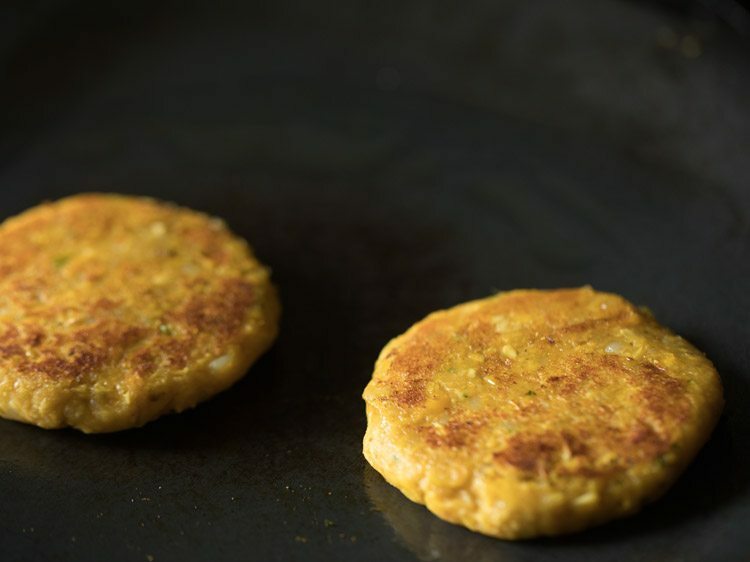 23. you can also fry the round kabab with 1 to 2 teaspoons of oil. 24. when one side golden, turn over and cook the second side. flip couple of times till the corn kebab are crisp and golden. 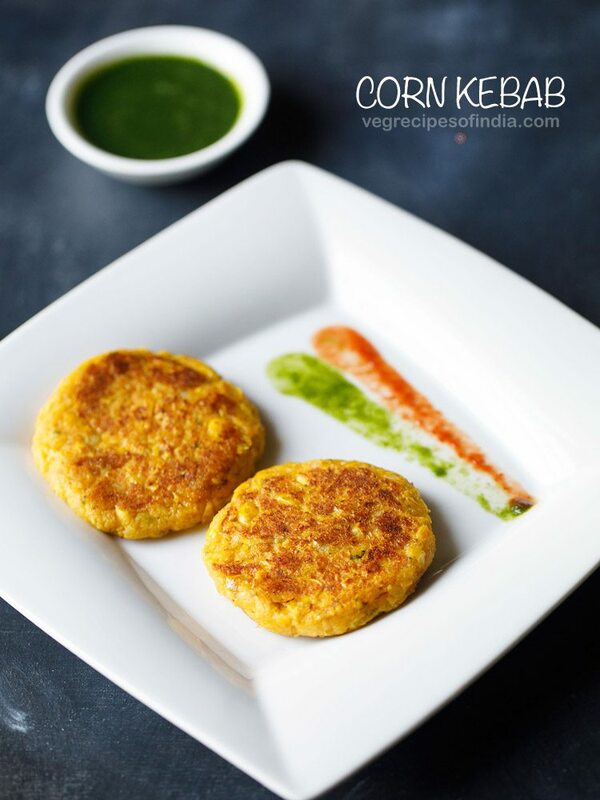 25. serve sweet corn kebab with any tamarind chutney or mint chutney or coriander chutney or mint-coriander chutney. 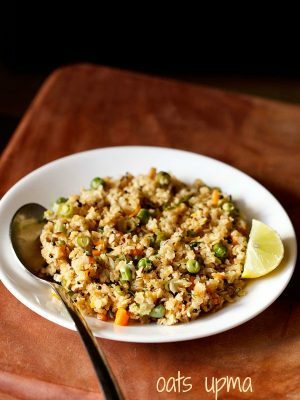 while serving sprinkle some chaat masala from top. Hi, made tday n it cm out well. My kids liked it. Shd hv made t corn coarse i/o fine paste. Used bread crumbs as a coat. Thanks Visa. Good to know this. Thanks Sheethel for your positive feedback. Yes I will keep on adding recipes.